Born in Urbino, one of the most refined courts of Renaissance Italy, and raised between Perugia and Florence, in contact with Leonardo da Vinci and Michelangelo, Raphael Sanzio was one of the greatest interpreters of the Renaissance. Early bloomer, twenty years old he had already performed some masterpieces and when he died at thirty-seven he was considered a genius. The sources recall his great ability to adapt: ​​he was able to work in harmony with everything, to speak with princes and scholars, using any technique with the same success. Raphael Sanzio, also known as Raphael Santi or simply Raphael, was born in Urbino in 1483 by Giovanni Santi, moderately successful artist at the court of Federico da Montefeltro. The young man showed extraordinary gifts as a child and, when his father died in 1494, he already enjoyed some autonomy, so that he could move to Perugia to cooperate with the well-established Perugino. His first works, performed since 1499 mostly in Città di Castello, show a strong influence of the teacher and immediately reveal the great ability of the young artist to imitate and elaborate the style of others. 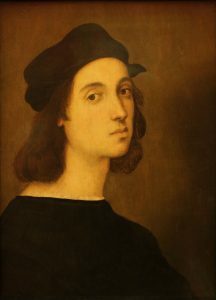 Raphael managed to establish himself as an independent painter in Perugia, the city of his teacher, where he obtained the protection of the powerful Baglioni family, and Urbino, protected by Giovanna Feltria, the daughter of Federico da Montefeltro – lord of Urbino – and wife of Giovanni della Rovere. On October 1st, 1504 Giovanna Feltria wrote a letter of recommendation for the artist, addressed to the mayor of Florence Pier Soderini, begging him to find and important public commission for the artist. The first years in Florence, however, did not have to be very easy: Raphael Sanzio had to deal with a city full of talents, dominated by Leonardo da Vinci and Michelangelo. In Florence all the energies of the young artist were absorbed in the study of the works of Tuscan artists, ancient and modern, and in the production of paintings for the houses of wealthy Florentines, mostly depicting Holy Family or portraits. In these two types of subjects Raphael was immediately undisputed master, working models that have had tremendous success over the centuries. No other artist better than Raphael Sanzio could possibly depict the tenderness, love and affection that unite the members of the Holy Family. The artist, however, did not represent an ideal of perfect beauty. We could say that the characters painted by Raphael have irresistible charm because, as opposed to those of Leonardo or Michelangelo, are simple and natural. In his stay in Florence, Raphael Sanzio revealed his qualities of great portraitist, as we see from the pictures of the Doni (Pitti Palace). He is capable of adapting his style depending on the character he has to represent, from the solemnity of the official portraits of the Popes Leo X and Julius II (Uffizi Gallery), to the sensuality, flirty, sometimes ironic style when depicting female figures, like his famous Madonna della Seggiola or the portrait called “la Fornarina” (both in Palazzo Pitti). In 1508, Pope Julius II, perhaps advised by Bramante, called Raphael to work in the Vatican, where he was building the new basilica and decorating the new apartments of the Pope. The most important works of the artist, from then on, would take place mainly within the papal city (the rooms, the tapestries for the Sistine Chapel and the Loggias). The most famous of the vatican frescoes by Raphael Sanzio is the school of Athens, representing a large meeting of ancient philosophers in a monumental building inspired to the contemporary design by Bramante for the new basilica of St. Peter. Unfortunately, the life of Raphael Sanzio was short, as he died at just 37. According to Vasari’s Lives, it was a short illness that killed him in just 15 days. Raphael is buried in the Pantheon in Rome.